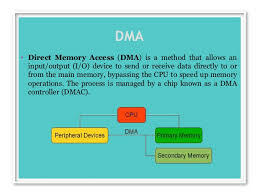 In this module we will discuss on the different methods of accessing memory and the steps to be followed and concept of accessing the memory directly and randomly. This is the 38th module on learning C with us. Earlier we discussed on the basic introduction and structure of C, preprocessor it's features, intermediate and executable codes. compilation and execution process of a C program. And keywords and identifiers, data types, variables and constants, scope of variables, operators and expressions in C. Type casting in #C. Introduction to input and output functions and reading a character in #C. Unformatted and formatted input functions. Branching statements like if, if-else, nested if-else. 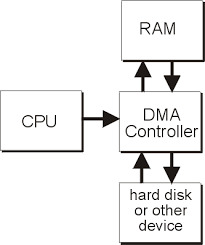 Different types of loops and units, different memory types like ROM ( read only memory) other than RAM (Random access memory) and it's individual types like PROM, EPROM, EEPROM etc. And flash memory, optical storage and cache memory,sequential memory access method. In the direct access information is stored on tracks and each track has a separate read/write head. Using that read/write head information of that track could be accessed sequentially. This feature makes it a semi-random mode which is generally used in magnetic disks. 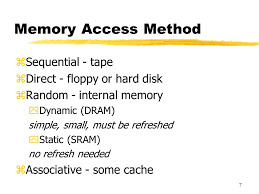 It is the access mode where each memory location has a unique address. 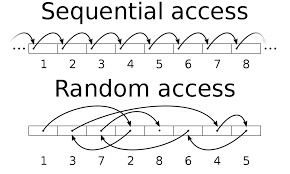 Using this unique address each memory location can be addressed independently in any order in equal amount of time. 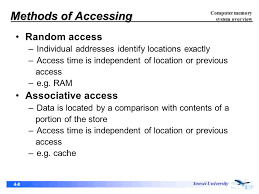 The desired location is in beginning of memory or it is in the end access time of information from both the locations would be same. This is done with the help of access mechanism which is separate for each location. Generally, main memories are random access memories. In next module we will discuss on the introduction to programming language and types of programming languages like high level and low level and machine level languages.